This past weekend we opened the doors to our brand-new Airbus A320 and latest generation Boeing 737 simulators, giving aspiring and current pilots of all ages the chance to fly them both for free. Our Airline Training Centre at Cambridge Airport played host to our very first Airline Pilot Careers Open Weekend, giving delegates the chance to not only fly our simulators, but to talk to our partner flight schools Leading Edge and Aeros. Our Airline Training Advisors were also present, offering advice on how delegates could start their journey to becoming an airline pilot. Both days delivered a variety of talks aimed at those interested in starting, or continuing, their development toward a career as an airline pilot. This focus allowed delegates to discover the various ways airline pilots can be trained and how they too could make a dream to fly come true. Capt. Lindsay Craig of BA and Anthony Petteford of VA Airline Training answer questions during a Q&A session. Capt. 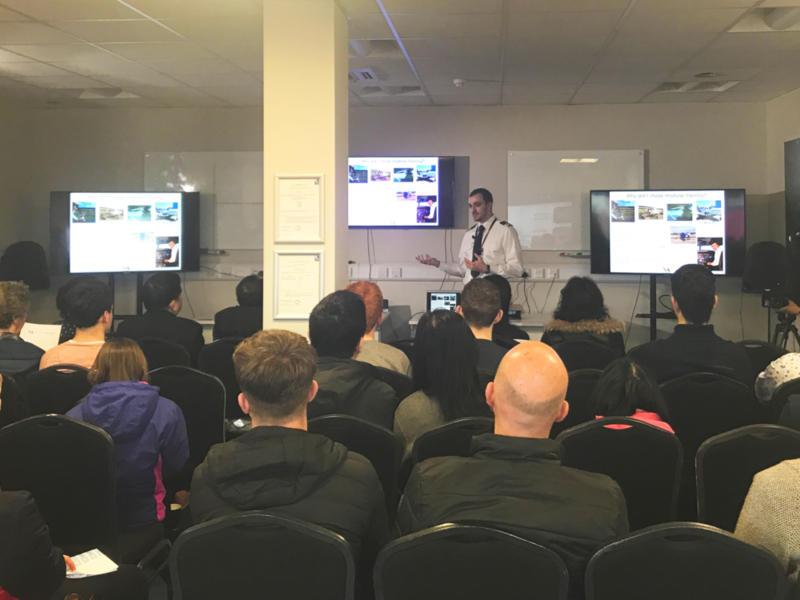 Lindsay Craig of British Airways Planning and Recruitment kicked things off on Saturday, talking about BA pilot career opportunities, including a Q&A on BAs Newly Qualified Pilot Scheme for Modular Graduates. With a packed room and keen ears Lindsay delivered an excellent talk that dove into the opportunities for budding airline pilots at BA, inspiring those looking at starting their flight training and current pilots alike. After a flurry of activity in our A320 and B737 simulators our very own Anthony Petteford took to the floor to discuss the different pathways to become an airline pilot. Anthony took delegates on a detailed journey through a variety of training routes, laying out the different directions you could take, and balancing the pros and cons of each. On Sunday, we once again saw the pathways to becoming an airline pilot laid out and discussed. The day also saw the progression of two VA graduates, Lewis Crask of Titan Airways and Dani Ungaro of Ryanair respectively, as they spoke to the weekend’s delegation about their training journeys and typical days as an airline pilot. Lewis, now First Officer with Titan Airways flying the Airbus A320, gave an invaluable insight into what its like to be an Airline Pilot day to day, as well as his experience of training with VA through our First Officer Programme. Dani, due to start his Type Rating with Ryanair on the Boeing 737, offered his thoughts and experiences on modular training and what it’s like to undertake APS MCC training with VA and our graduate’s ­success. VA Airline Training graduate Dani Ungaro, who recently secured a position flying the Boeing 737 with Ryanair. Both days incorporated the expert instruction of our airline pilot instructors in both the Airbus A320 and Boeing 737 to all those looking to experience the thrill of our simulators. A Cessna 172 Skylane was also available for future pilots to investigate, with the chance for first time flyers to take to the skies in the same aircraft through our partners at Cambridge Aeroclub. We’ll be organising another Open Weekend soon, delivering more fantastic opportunities for aspiring and experienced pilots alike to come to our Airline Training Centre and discuss a variety of training options that suit them. Keep an eye on our LinkedIn, Facebook, Twitter and Instagram, as well as our website, for information on our next Airline Pilot Careers Open Weekend. To make an enquiry regarding our APS MCC course, or for further information about how to become an airline pilot, email airlineready@va-airlinetraining.com or call +44 (0)1223 979737. Get in touch and let your career take flight.